Opening day is getting ever closer, but for some of us it doesn’t feel too much like Spring just yet. Regardless of the weather the bowling green opening day preparations must go on. In part 1 of this series, we did a bit of evaluation work to try to figure out what the green needs in the lead up to the big day. After giving the green a general tidy up and maybe a cut at 8mm or so, the general surface conditions should have become much clearer and in most cases what at first seemed like a mess will now be looking remarkably perky. Of course, what lies beneath might be a different story, so armed with the results from your exploratory soil sampling let’s have a look at the possible signs of problems we might encounter and figure out the best way to handle them. 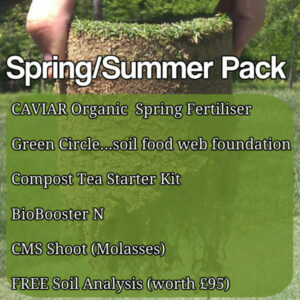 This is a great time to get a Soil Analysis done too. On many greens and especially on very sandy ones, there is an imbalance of base nutrients which holds back progress due to low Cation Exchange capability and pH problems. You shouldn’t of course have put the green to bed in the Autumn as many clubs do, as the Winter months provide a fantastic time to get on top of de-compaction by deep slit tining regularly. Any build up of debris such as leaf litter from trees, papers, twigs or excessive grass growth or water logging due to excessive thatch or poor surface drainage will have increased the likelihood of a fungal disease outbreak on the turf. If you have disease such as fusarium on the turf this will be very clear. Orange/russet brown/pink round patches sometimes with white mycelium or slime will indicate that the disease is still alive and working and might need a spot treatment of a contact fungicide to check its progress. If there are a range of light brown, bare circles/patches then this is more than likely indicative that you’ve had a disease outbreak that has run its course and spraying won’t do anything at this stage. If disease scarring is extensive, it might be necessary to repair these scars by plugging them out with a turf repairer or golf hole cutter. If you decide to do this, you should use un-scarred turf from a corner of the green to replace the scarred plugs you’ve removed from the “in play” areas. To replace the plugs you’ve taken from the corner, you have two choices; either use the scarred plugs and leave the corner at a higher height of cut for a while at the beginning of the season or replace them with fresh plugs from your repair nursery if you have one (highly recommended). In most cases, if you’ve been vigilant through the winter months you won’t need to do much of this type of repair work. Conventional thinking says that the green should be in excellent fettle on opening day, but for most clubs opening in early to mid April or even late March, getting to this position is going to be tough. Greens that have been maintained using the accepted rules and methods for decades are highly susceptible to moss infestations in the close season and it can become a big problem to deal with correctly before the season kicks off. One of the biggest issues in preparing the green for play this early when the grass isn’t growing vigorously is how and when to deal with moss. Scarify the green too early and you run the risk of creating more space for moss to establish whether or not you’ve treated the moss or not. Scarifying also introduces the risk of spreading existing moss throughout the green. The one critical factor to ensure the best result from moss treatment/removal work is vigorous grass growth. This is needed to enable the space created by killing and raking out the moss to fill in with good fine grass instead of more moss. There will be no significant grass growth until the soil temperature exceeds 50C. Again, due to decades of use, many greens have Iron readings that are off the scale and damaging to the soil’s nutritional capability, so it’s best to avoid lawn sand. Chelated Liquid Iron is a better option and is more readily used by the plants into the bargain. It isn’t acidic and doesn’t hang around in the soil for ever. Whatever way you go, you should allow at least 7-10 days before scarifying. Scarifying should be quite a severe operation, but will tidy up well after a cut. Resist the temptation to go for perfection on opening day. If you don’t have growth yet, it’s probably better to deal with the moss a few weeks into the season than now. Pre season fertiliser choices depend very much on your situation and at what stage your green is at in terms of the Performance Greens Program. If growth is slow, a little quick release Nitrogen can be helpful in getting things going even if the soil temperature isn’t up to 5 degrees yet. If the green was over-seeded in the Autumn, a little added phosphorus will help with rooting. Our Compressed Molasses Granular delivers exactly what the plants and soil needs and adds a carbohydrate boost to the soil microbes into the bargain. As growth takes off, you can move on to monthly BioLiquid fertiliser treatments as per the Performance Greens Baseline program. Mowing frequency should be stepped up now and the height gradually lowered as the soil warms up. It’s important to avoid sudden changes in mowing height of more than 0.5mm at a time. It’s also counter-productive to try to get the green down to summer height for opening day. If growth isn’t vigorous you’ll set the green back by weeks. Root mass is directly proportional to leaf tissue bulk, so shorter and fewer leaves will result in sparser and shallower roots. Mower sharpness is critical. The cylinder should be as it’s name suggests, perfectly cylindrical so that it can be set reliably with zero contact between it and the bottom blade. The bottom blade should be perfectly level and have its front and top angles ground correctly. This is one of the most important aspects of bowling green maintenance. You should be cutting weekly now, stepping this up to at least 2 cuts weekly in April and aiming for full summer mowing regime of 3 or more cuts per week by May. The lowest cutting height I would recommend for UK bowling greens is 4.5mm and it’s unlikely that this can be successfully reached before June, certainly in the northern parts of the country. Southern areas might be able to introduce lower mowing heights a little sooner depending on conditions. All of these recommendations are again laid out in the maintenance programs in Performance Bowling Greens. The most effective time to deal with excessive thatch is in the Autumn renovation period, but the green will still benefit from a severe scarification in two directions in Spring, but again, this must be after vigorous and continuous growth is underway. This can double up as a moss removal operation 10-14 days after applying a moss treatment. Opening day should be for enjoyment now that we’re released from the grip of winter. Don’t spoil the occasion by trying too hard to get the green to think it’s Summer already, that’s not officially until June! By taking it easy and letting the grass, soil and weather dictate the rate of progress you will have a much less stressful greenkeeping year. Any questions, just pop them in the comments or send me an email from the contact form.